I work late during the week and as such my bosses will only allow me a night off on very special occasions. Previously, I've only been afforded this luxury for Lewes awaydays at Havant and Waterlooville and Braintree Town. Fortunately, Leatherhead away in the FA Cup Second Qualifying Round Reply was deemed worthy of a golden pass. The Tanners of Leatherhead are managed by Mr Football aka Mick Sullivan. We've had dealings with Mick on these pages before. 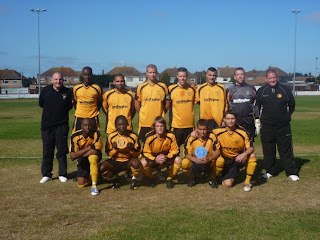 In his previous guise as gaffer of Merstham, he arranged for our - now annual - MFC team photo, complete with EFW logos. He's one of those chaps who (as long as you procure him a post match beer) will stop and talk footy until the cows come home. Not an idea that Arsene Wenger would entertain - he'd probably claim he didn't see you. I don't want to name drop here (what!? you've been waiting for months to shoe horn in this story) but the last time I bumped into my good friend; Sky Sports pundit and ex-West Ham legend Tony Gale - you know played for England U21s, everybody has heard of him - he told me that Sully would be welcome at his club any day of the week. Rather like Alan Ball, he couldn't speak highly enough of him. 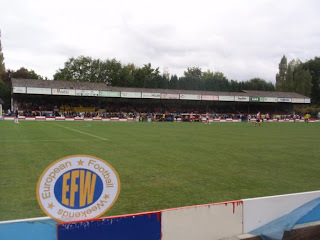 So my mate Sully v EFW's very own Lewes FC in the FA Cup for a chance to play Vinny Jones and Stuart Pearce's Wealdstone away in the next round (ok, ok, you can have the night off, just get on with it - Boss Ed). Football or shopping!? Who goes? Who stays? You decide. A window of opportunity at Fetcham Grove. Flag day for Cynical Dave and Big Deaks. 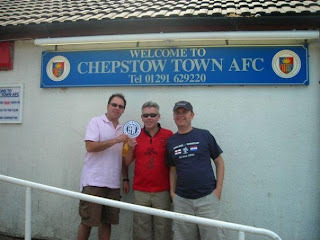 As is the norm these days, Cynical Dave, Big Deaks and I arrived in the clubhouse several hours in advance of kick off. 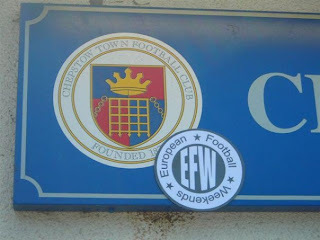 This is part of our continuing quest to pump money into non-league football - in return for beer. If you want any reassurances as to what the FA Cup means to sides like Leatherhead and Lewes then we need look no further than the establishment we chose to drink in. The Tanners splendid clubhouse was funded by their glorious FA Cup run of 2006/07 when the reached the giddy heights of the 1st Round Proper (Proper!). 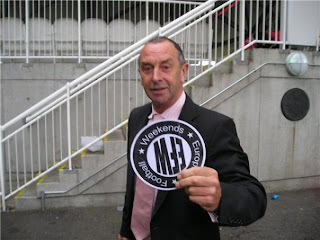 In the aforementioned bar we bumped into our pal Rog the Lewes groundsman. We cemented the EFW deal with him to burn a huge 'LEWES FC' into the famous grass bank at the Dripping Pan. After that we teased him mercilessly about the quality of the Tanners pitch. So good that their groundsman Dave Blaszkowsi waltzed off with a highly commended certificate in the recent 2009 Groundsman of the Year Awards. Good old Rog, just don't mention 'fireworks' to him - you'll be there all night! Now then, what next!? *checks notes* oh yes - the match. Despite being two leagues below The Rooks, Leatherhead put up fine rearguard action. Keeper Craig Bradshaw was in fine form and the live wire Marc Elston gave Lewes all sorts of bother down the wing. In fact I think we'll sign him up if you don't mind Sully!? In an act previously unknown to man - Cynical Dave even praised Bradshaw for his efforts after the match. As for Elston, he went off with leg-knack late on in the match and with that went the Tanners best hope of progress. Lewes had a procession of possession throughout but it wasn't quite happening in the actual scoring of a goal department. In saying that, they did score a perfectly good goal in the second half but in a mystifyingly bizarre act - the referee decided to disallow it after Dan Beck was deemed to have fouled Bradshaw after the ball had crossed the line. Bradshaw (him again) also saved a penalty from Joe Keehan after David Wheeler had been brought down. ....but Bradshaw has other ideas and fancies a bit of extra time. Luckily, subs see funny side to Marc Elston's leg-knack. I'm running out of superlatives to describe David Wheeler. If that lad hasn't got his Coca-Coca skills badge, I'll eat my hat. Of course it was him who set up The Rooks winner in extra time. As the mist descended on the ground, he cast another spell on the Tanners defence, turning this way and that before unleashing a pin-point cross to Joe Keehan who made amends for his penalty woe by leaping like a salmon and nodding Lewes into the next round. Cue frenzy behind the goal from the 60 or so travelling army. 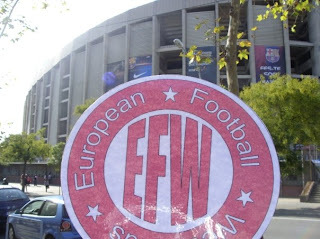 The EFW team were joined on the last train back to Brighton after the match by a couple of Arsenal fans. They'd been to see another pointless group stage match in the Big Cup against Olympiakos. Steve and Farz - for it was they - argued the case for spending umpty trumpty pounds to watch a routine win in near silence at the Emirates (£13.50 for two hot dogs and some Arsenal branded water by the way). 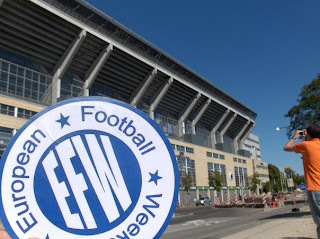 The EFW team on the other hand tried to reason that £8 to see Leatherhead v Lewes was on the whole about 600 times better value. In fairness, they've promised to come and see a match at Lewes in the near future. 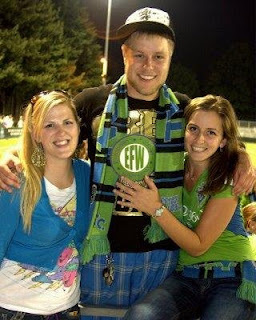 Another two converts to grass roots football!? Honestly, what's not to like!? Click to enlarge these panoramic images. Yeah alright Ed, you trying taking them after 6 pints you lemon. For further reading on The Tanners head to their website or to the rather fantastic unofficial site The Lip put together by Matt Ross. 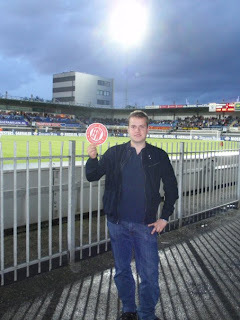 For more photos from the match CLICK ME. 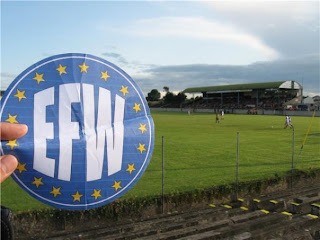 After a three month 'think tank' it has been decided that following on from the huge success of the EFW Gallery parts 1, 2 and 3 - we should launch another which is both bigger and better and call it: the EFW Gallery Part.......wait for it.....4 (genius and relax - Ed). 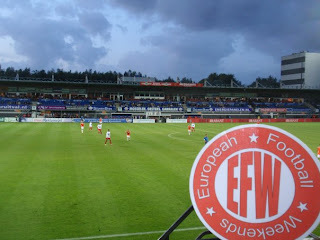 Whereas the Easy Jet Teddy Bear gets photographed looking bored on hotel balconies, our lucky logo gets to sneak into football grounds around Europe and on the odd occasion into the hands of A-list celebrities. Shall we kick off with Aggers!? Start the car! It's Bumble! Aussie cricket legend Michael Slater - extra points for the smile Slats. This might explain Slats smile - it's the npower girls. EFW team of the year 'Merstham FC' keep up their annual tradition with a team photo complete with logos. 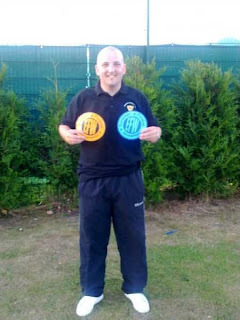 Meet the new Merstham gaffer Graeme 'Banners' Banyard. Welcome aboard mate! 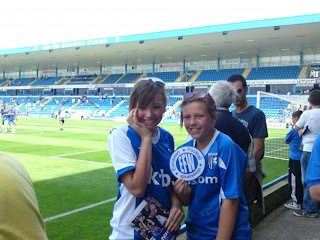 Gillingham fans Racael and Bronte in the Rainham End before stuffing a very unhappy Swindon side 5-0! Good work girls! 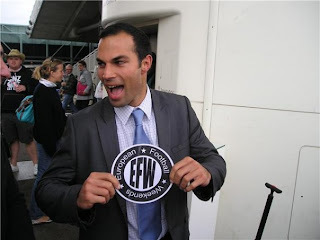 Robbie Williams and Oasis failed to do it but it looks as though EFW is set to crack America! Following our article about the Seattle Sounders - that caused a bit of a stir - logos were called for and sent and we're pretty grateful they arrived safely in the hands of Erin and Amanda. 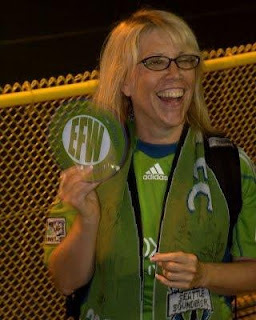 ....and everybody seemed very happy with the EFW/Sounders partnership. 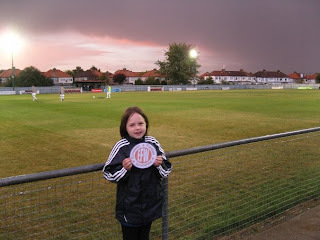 Here's young Lolly Fuller taking a break from her new role as official photographer for The Ball is Round at Brimsdown Rovers. 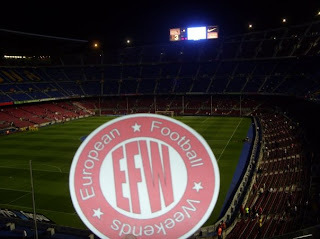 Daniel Campbell + EFW logo + Camp Nou = happy days. ......and why not outside as well! 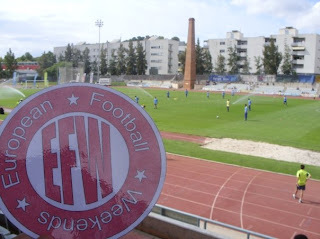 Who took us to Espanyol B!? Mr Daniel Campbell of course - cheers Danny Boy! The Mclogo at Cove Rangers. 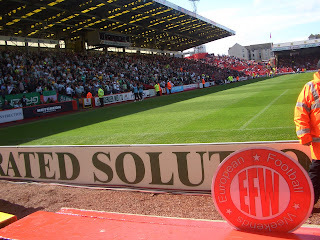 3,000 Celtic fans and many more Aberdeen fans look on in awe as the logo is unveiled at Pittodrie. 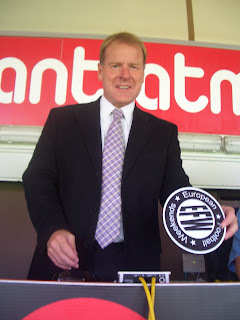 Why if it isn't ex-Celtic and Borussia Dortmund legend Murdo MacLeod! 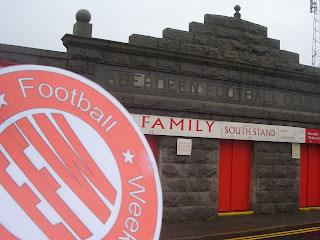 Standing free outside Pittodrie, Aberdeen. 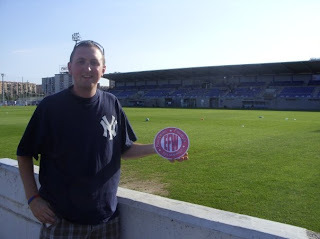 Alain, Eli and Fran at Barakaldo CF, Spain. 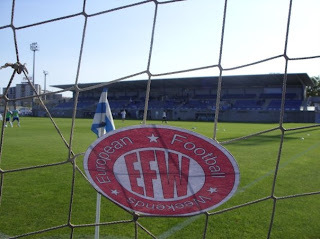 Sestao River Club in the Basque Country. 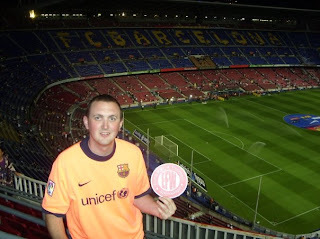 Some loon on the pitch at Athletic Bilbao. 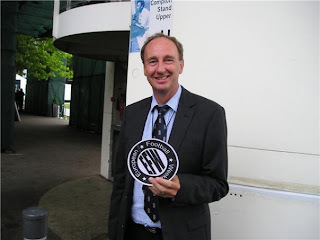 Big Deaks saves the logo at Bromley in front of Mr Fuller. One for the album. It's Cynical Dave. Big Deaks, Crabby, Daddy, Lasty and Arnie. St Albans!? Don't mind if we do. 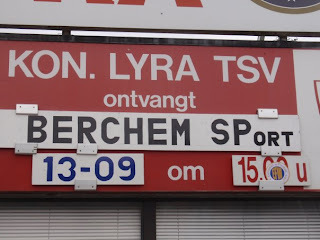 The old 'sneak on the fixture board' number. 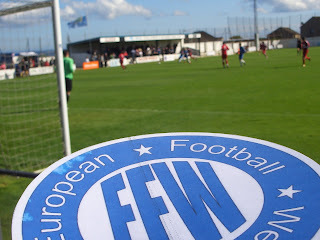 The launch of the EFW t-shirt at Llanelli. Incredibly some are still available! 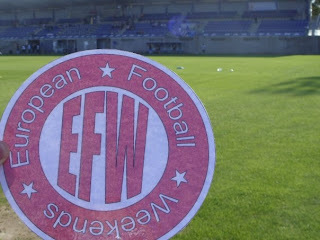 Motherwell fans sign up for EFW. 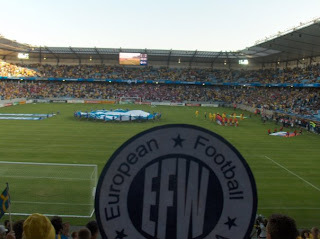 In Malmo, Sweden for the UEFA Euro U21 2009 (Sweden v Serbia). Brilliant! We've arrived on the scoreboard at Kon. 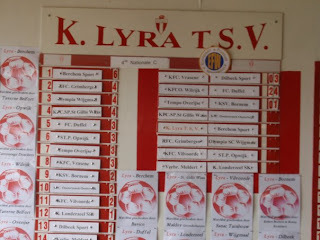 Lyra TSV in the Belgian 4th Division B. Dreamy. Proudly on show inside Kon Lyra TSV. Strike a pose there's nothing to it. 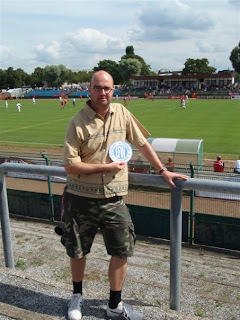 Stoffers at the Sportforum Hohenschönhausen, BFC Dynamo Berlin. 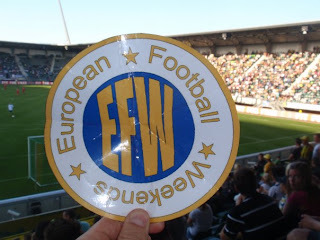 EFW Members' Meeting at the Berlin branch. 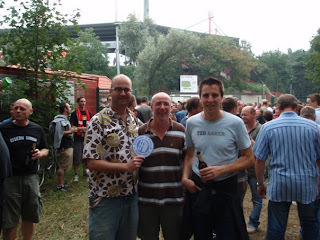 Stoffers, Graham & Iain. 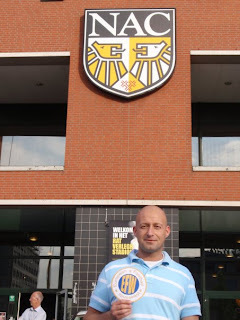 ADO Den Haag - tick. 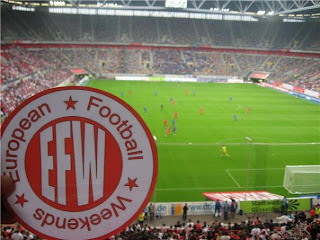 Fortuna Dusseldorf!? No problem Sir. 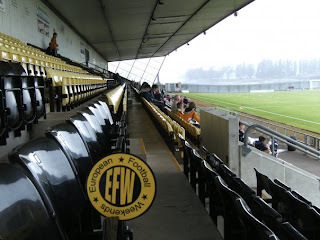 Dumbarton, The Sons, Strathclyde. Yeeeeees! 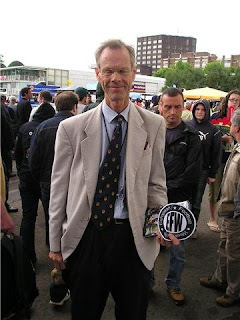 ....our pals from Forest Green Rovers of course. See you in Tilburg lads! 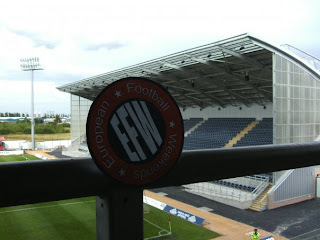 The show logos on at Falkirk. 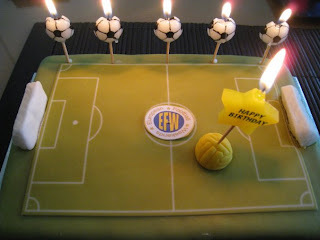 EFW birthday cake (send for the doctor - Ed). 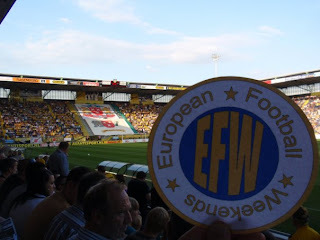 NAC Breda prepares for the EFW Oktoberfest invasion. Our pal Pat. One of our best ever signings! 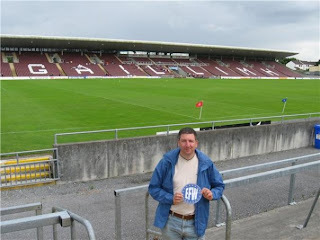 Dave Griffiths at Pearse Stadium, Galway. All the way from Tuam. Graeme Holmes back in Ireland. 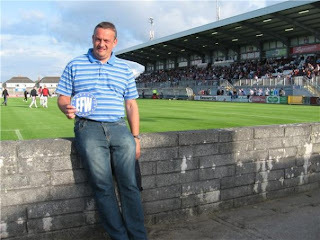 This time for the Galway Utd v Cork City. 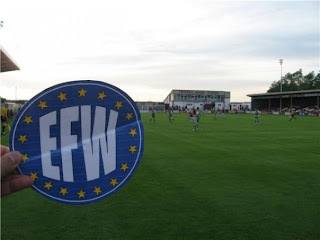 Terryland Park, home to Galway Utd. And finally, lets finish in Russia shall we!? 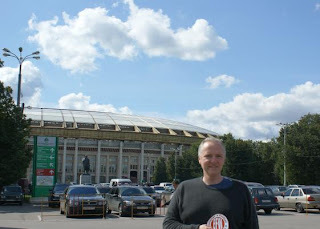 Mark Griffiths showing his loyalty to the EFW cause at the Luzhniki in Moscow. Thanks a million to the following, without whom etc etc: Nick Waterhouse, Graeme Banyard, Gary Lomas, Stuart Fuller, Steven Van Rompaey, Patrick Van Puyenbroeck, Prost Amerika, Daniel Campbell, Big Deaks, Anna Mckenzie, Christopher Nash, Andy Challen, Cynical Dave, Graeme Holmes, Dave Jones, Mark Griffiths, the TMS team, Phil Sheppard, Stoffers, Her Maj, cuddly toy, kitchen sink, is anyone still reading (probably not - Ed). 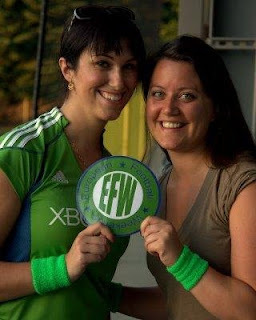 If you want your team featured or you are off on an EFW of your own. Drop us a line at dannylast@hotmail.com and we'll send you a logo.